On April 3, 2017, the Tennessee Supreme Court’s Indigent Representation Task Force presented its report to the Court, entitled, Liberty & Justice for All: Providing Right to Counsel Services in Tennessee. The report offers detailed recommendations to improve the delivery of legal representation to Tennesseans who cannot afford it. In late 2015, under the direction of then-Chief Justice Sharon G. Lee, the Tennessee Supreme Court appointed judges, attorneys, and other stakeholders involved in the civil, juvenile and criminal justice system to the Task Force to review practices regarding issues surrounding the delivery of representation and compensation for those who provide services to individuals unable to afford legal counsel. The Task Force held nine public meetings in Nashville and heard from nearly 90 people during an eight-city listening tour across Tennessee. The Task Force heard presentations by and received submissions from judges, lawyers, court clerks, judicial associations, justice-involved organizations and members of the public. In addition to the information gathered during its listening tour, the Task Force reviewed studies and reports detailing how other states provide legal representation to eligible adults and juveniles. The Task Force also consulted with national organizations regarding standards from throughout the country. Through the Administrative Office of the Courts, the Task Force obtained technical assistance from the Sixth Amendment Center through funding provided by the U.S. Department of Justice, Bureau of Justice Assistance, National Training and Technical Assistance Center. 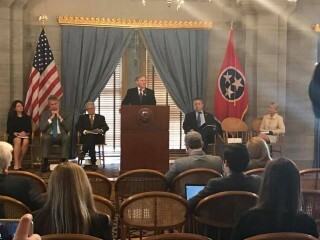 The Task Force recommends in its report that Tennessee (1) promote statewide uniformity in the programs providing legal assistance, (2) improve the quality of legal assistance being provided and (3) enhance the management and oversight of these programs. The report offers seven detailed recommendations to improve the delivery of legal representation to those who cannot afford it. 7. Adjusting Tennessee Supreme Court Rule 13’s caps on compensation paid to experts to market rates. Justice William C. Koch, Jr. (Ret. ), Dean, Nashville School of Law and Task Force Chairman discusses each of the seven recommendations made to the Court.